Manchester City's win over Brighton on Saturday was a low-key affair, played out against the backdrop of empty seats and an atmosphere far removed from what these occasions should be and used to be. Fast forward 24 hours and Wembley was a packed house, a cascade of colour dressed in the yellow of Watford and the old gold of Wolves - and playing host to a thriller that can take its place alongside the great FA Cup games. Wolves were narrow favourites in what was almost a 50-50 contest and it looked like Watford would be the team wondering what might have been as goals either side of half-time by Matt Doherty and Raul Jimenez gave Nuno Espirito Santo's side total control. Nuno reacted joyously and the Wolves fans, here in vast numbers, were looking ahead to this great old club's first FA Cup Final since May 1960, when Blackburn Rovers were beaten 3-0. It is never wise to ask those questions in the FA Cup and in Wolves' case the answer was Gerard Deulofeu. This maverick 25-year-old, a player of undoubted talent but unfulfilled potential at Barcelona, Everton, Sevilla and AC Milan, chose what looked like Watford's losing cause to produce a cameo performance as substitute that will write his name into Vicarage Road folklore. It was to no avail - because there is no Watford show without Troy Deeney. Watford's talisman was always going to have his say and it came deep into stoppage time when he was fouled by Leander Dendoncker. Referee Michael Oliver waited to confirm the decision in his own mind, called it right, and Deeney remained calm through VAR confirmation to lash the equaliser past Ruddy. It is too easy to criticise Nuno's substitutions because nine out of 10 times they will go off without incident. 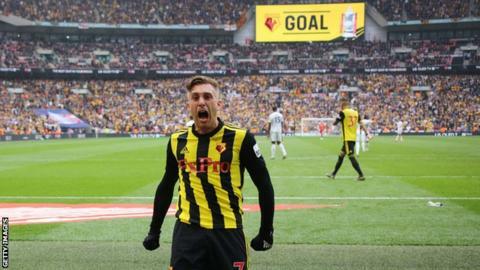 As the strains of Sir Elton John, Watford's most famous supporter, swept around Wembley stadium, Hornets fans celebrated with joyous disbelief. They had been taken to the heights of elation after facing despair. In contrast, after giving their players an ovation, the Wolves' fans were left to their devastation as they left Wembley and headed back up the M40 wondering how what looked like certain victory had been torn from their grasp, the wins over Liverpool and Manchester United in previous rounds now counting for nothing. If anyone wanted to ask that vexed question about just how much the FA Cup still means, they could have posed it to these two sets of supporters at the final whistle - with wildly differing results. No so-called "Big Six" - simply two fine, well-run clubs throwing everything at each other in the fight for the great prize of a place in the final in a trophy they still feel is within their compass. Nuno has done an outstanding job at Wolves, producing an attractive, organised side - but it will take some time to recover from this agonising loss. As for Watford, what a job the under-stated Gracia has done and he was rightly given a hero's reception as he smiled and waved modestly as their fans when he made his way back to the tunnel after the celebrations. The decisive moment, deep into injury time with everything on the line and the pressure immense, was when he proved conclusively he can talk the talk. He stared at Watford's fans to compose himself, to take in the moment, before demonstrating such reliability from the spot. He was not going to leave wondering. He thundered the spot-kick into the back of the net. And as for the FA Cup, this is not a competition that will go quietly.